The National Federation of Young Farmers’ Clubs (NFYFC) and partners in the Farm Safety Partnership (FSP) are committed to helping reduce farm work place fatal accidents by 50% by 2023. The FSP partners are launching a safety campaign in 2019 focusing attention on four of the top causes of farm work place fatality and injury. The aim of the campaign is to highlight changes that can be made by farmers to farm work place behaviours which if implemented have the potential to significantly improve the safety record of agriculture and save lives often at minimal cost. The focus on transport launched on 8 January 2019 at Lamma and a new NFU Vehicle Health Check Guide has been released to help farmers maintain and use vehicles safely and comply with the law. Copies of the guide are available to download from the NFU online. 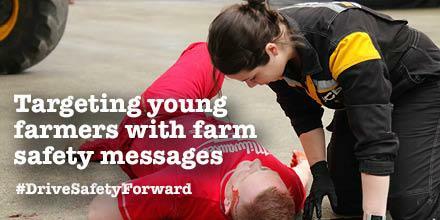 YFC members can support the transport safety focus on social media using #drivesafetyforward and NFYFC will be using the hashtag too. NFYFC is also urging YFCs to deliver the Farm Safety Curve training in their clubs this membership year to raise awareness of farm safety. The farm safety Curve module, developed with Yellow Wellies, is one of the first initiatives to specifically target young farmers and was launched to help challenge and change the behaviours of the next generation of farmers in the UK. Norfolk FYFC member Edd Barker, a YFC Trainer, had a farm accident and was determined to teach the younger generation to not make the same mistakes and has delivered the training to clubs across the county. "If people understand it when they’re younger – before they’ve had the chance to learn bad habits – then they should be safer when they’re older,” said Edd. Jim's story from Firsttouch.tv on Vimeo. The course also includes videos of people talking about their personal experience of farm accidents. Stuart Roberts, NFU Vice President and Chairman of the Farm Safety Partnership, said: “We are all aware that agriculture has a terrible track record when it comes to health and safety in the workplace, and the FSP is working with the industry to reverse this. “I genuinely believe we are starting to see farmers and their workers responding and now it’s time to redouble all our efforts in this area. Initiatives launched by the NFU and other FSP partners are having a positive effect, but we need to see more action on the ground. With the partnership delivering a coordinated campaign and looking at specific actions each season, we can really focus our approach on changing behaviours. For more information about delivering the Farm Safety Curve module in your YFC and for tips and advice, contact Josie Murray.